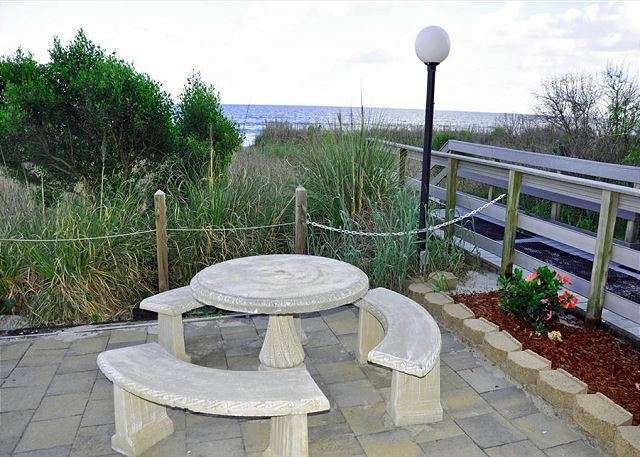 Great seating for everyone and ocean front views to mesmerize! THIS VIEW COULD BE YOURS! BREATH TAKING! Welcome to your fabulous destination at The Summit! Watch a movie or watch for dolphins-- your choice. Spacious and remodeled for your enjoyment!!! Seating for 3 more at the breakfast bar. Custom kitchen for prepping and cooking family meals. Dine-in or Carry-out. You decide on your vacation! Super master suite with king size bed for sleeping in late. Master bedroom with balcony access to enjoy your morning coffee. Master bath with super size shower to treat yourself after a long sunny beach day! Plenty of room with double vanities in the master bath. Great guest room with twins and flat screen tv. Guest room set up for the kids with flat screen tv. Nautical guest bedroom, outfitted for the kids, with private bathroom. Large vanity in this guest bath with shower. Guest bedroom with queen bed and private bath. Guest bedroom with flat screen tv, room for two in the queen bed and private bath. 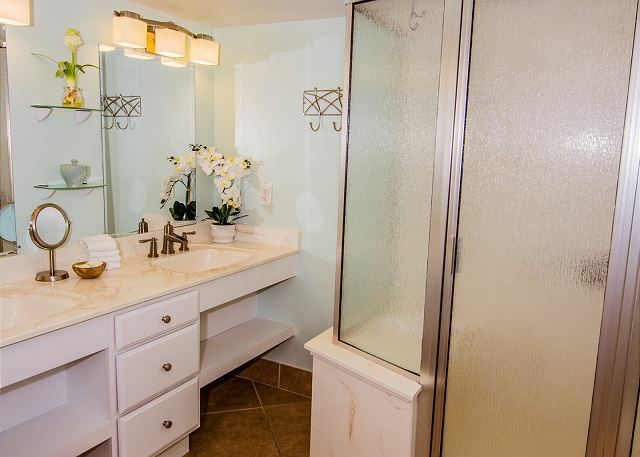 Private and updated guest bath with tub & shower combo. Grilling and picnic space for fresh fish from the local market. Beautifully maintained and manicured grounds around The Summit property. Sundeck and pool when you have had enough sand. 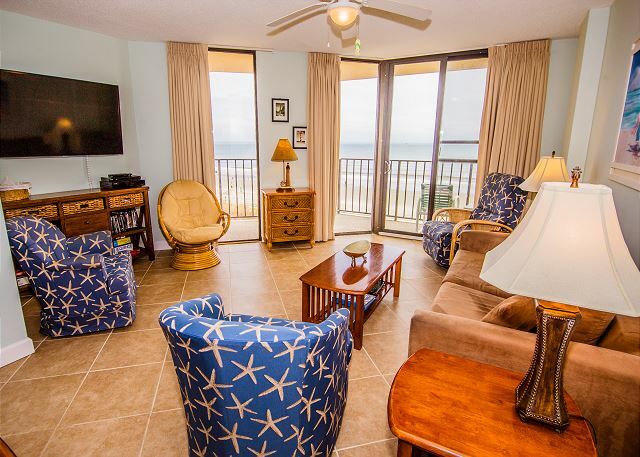 Your vacation destination begins when you walk through the doors of this beautiful ocean front condo. You will be amazed how the owner has expertly added all the right touches to make your stay that much more enjoyable. 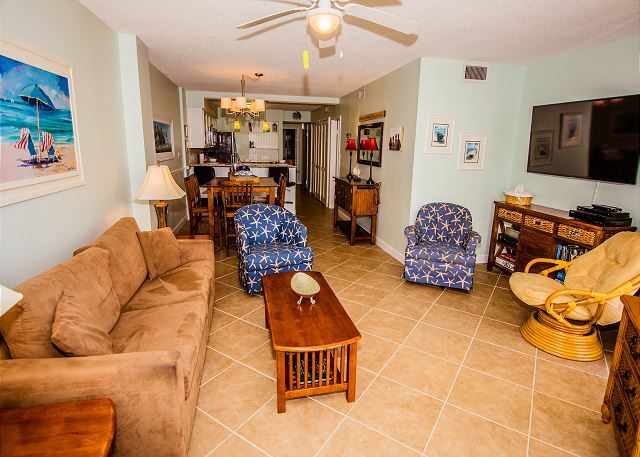 This large 3 bedroom 3 bath condo has it all, from its beautiful beach decor, to a well-appointed kitchen, comfortable bedrooms with updated bathrooms and special xbox set up with games for the kids to enjoy. This is the place where you family and friends will make memories that will last a life time! 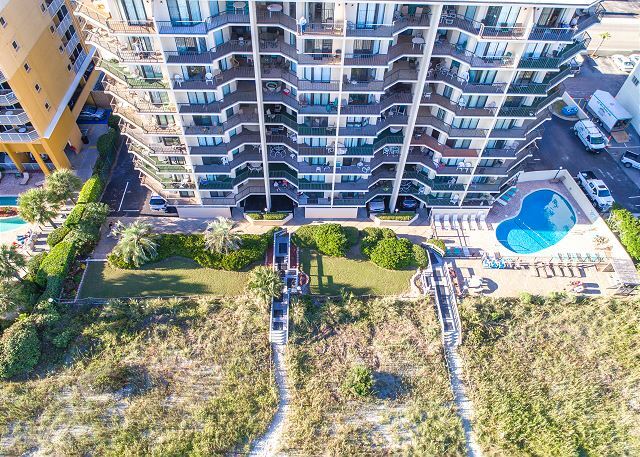 HIGHLIGHTS: Spend your days gazing out over the Atlantic on the large ocean front balcony and enjoying this comfortable, family friendly condo, with a private bathroom for every bedroom. Watch your favorite shows or movies on the flat panel Smart TV in the living room or the bedrooms, with DVD players too. You will appreciate the modern kitchen makeover with granite counter tops and updated bathroom cabinetry and granite counters, tile flooring throughout. Your reservation includes all the bed and bath linens, beds freshly made upon arrival, and your departure cleaning. AMENITIES: Fully stocked kitchen including a crock pot and blender, X-Box and DVD Players, BlueRay Smart Video Player, Smart TV in Living Room with WiFi access to Netflix. This owner has also provided books, puzzles and board games just in case the kids have a restless rainy day. 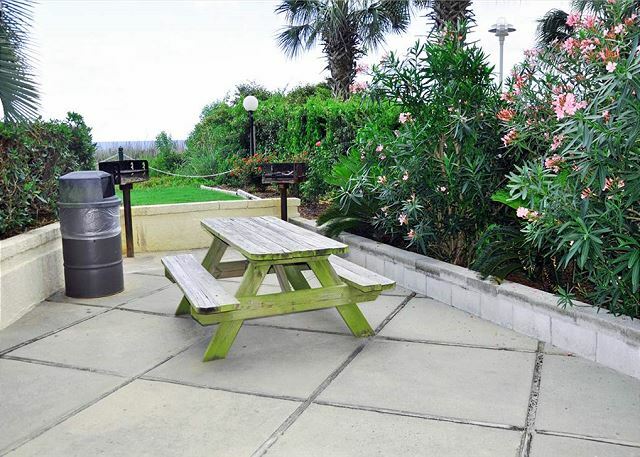 The Summit also has an outdoor pool (heated seasonally) and the sundeck allows you to catch the rays until sunset, and there are charcoal grills and picnic tables for cookouts. 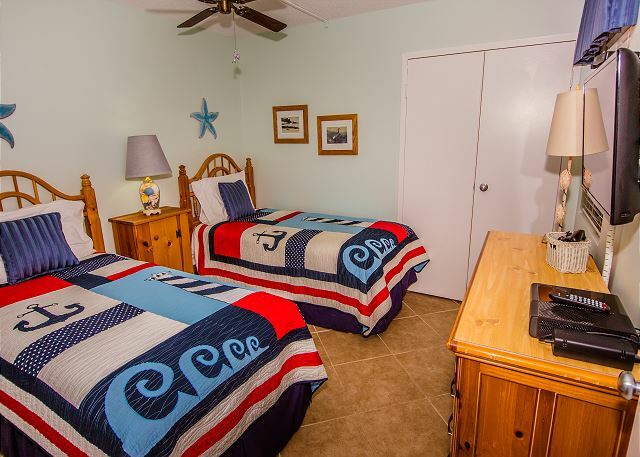 The owner also conveniently provides beach chairs and umbrellas, beach toys and boogie boards for your stay. OUT AND ABOUT: The Summit is ½ mile from one of North Myrtle Beach’s most popular destinations - Barefoot Landing (House of Blues, Alabama Theater, shopping, dining, attractions, etc. ), which backs up to the Intracoastal Waterway. There are also grocery stores and ‘spirit’ stores within a one mile radius. It’s a nice midway point to many other attractions as well, from Broadway at the Beach in Myrtle Beach to Calabash, NC (where you can watch the fishing boats come in with their catch-of-the-day...from pier to plate). Windy Hill Beach does not have thru-traffic from other beaches so traffic is minimal and the strip immaculate. Windy Hill is one of the widest beaches on the East Coast, so you can play Football/ Frisbee/Bocce Ball into the evening hours, even at high tide! The dunes have undergone a full restoration over the winter to rebuild them nice and high. The shallow 'tide pools' at low tide are perfect for toddlers, allowing adults leisure time without worry. Locally, you can enjoy golf, kayaking, horseback riding, parasailing, you name it!!! Seasonal lifeguards w/ beach chair and umbrella rentals are directly in front of The Summit. Great condo experience. Perfect location on Myrtle Beach. Would recommend this condo to everyone. Thank you for the wonderful review. ODVR and the owner of this condo really appreciate that you found everything to your liking. Even a simple positive note from a guest, means more to other travelers than our own biased opinion. Thank you for choosing to stay with us when you have so many choices. Absolutely loved the condo, location was great, plenty of room for all 7 of us. The owner had all of the beach essentials for our personal use which was fantastic. We will be back!! Thank you. We appreciate the high marks for our services and your overall satisfaction. This is our goal at ODVR with every visitor. 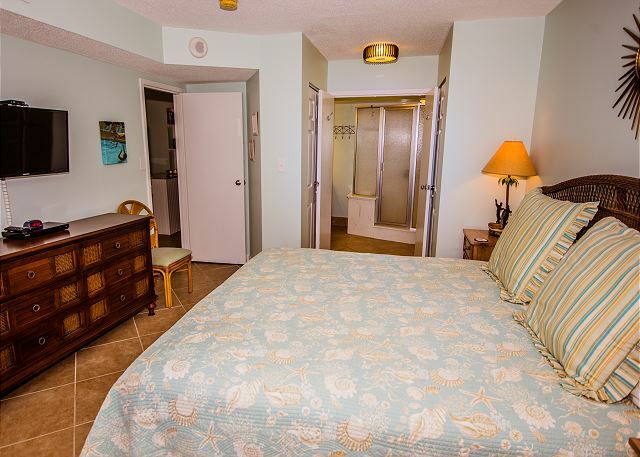 The condo owner does offer a homey beach retreat for guest to enjoy the great amenities of the Summit. Some guest want an exciting fun-filled beach trip and others just want to relax and rejuvenate, and this condo offers every possibility for your beach escape. Thank you again for the outstanding review. We look forward to your return. Wonderful place - we emjoyed it so much! 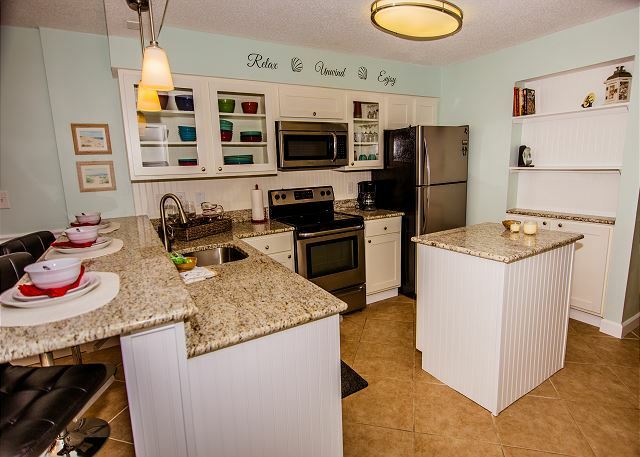 Just as pictured, ocean front, clean, minutes away from outlets and Barefoot Resort. Thank you for the super rating. We appreciate that guests notice when we get it right. Glad that you discovered what a great location the Summit offers, from shopping, dining, mini-golf, water sports and every adventure in between. This owner keeps a comfortable, well-maintained condo so that guests feel like they are on a real getaway vacation. Hope you enjoyed your ocean front balcony views of Windy Hill beach, too. Thank you for taking the time to let us know about your stay and we look forward to your return. Everything about this rental experience was better than I had expected. Before traveling to the Summit, we received a call from the ODVA office asking if we needed anything or if they could do anything to make sure we had everything we needed. Great customer service. I knew we would have wifi but was surprised to find it was a secure connection. Unit was very quiet. Not even the thousands of "bike week" motorcycles disturbed us. The kitchen was fully stocked with a wide variety of everything needed to prepare meals. The beds, although different from home, were very comfortable. A minor plumbing problem was corrected within an hour of reporting it. I will trust ODVA when booking my next vacation. We love to hear that we have exceeded any guest expectations. That really sets the bar high!!! Thank you for the great review to let others know about us, at ODVR, and that we played a part in making your vacation special. The owner will be delighted that you were impressed with the condo too. Every effort is made to keep the property clean, maintained and comfy for guests. The Summit offers a great beach escape in the heart of Windy Hill so location cannot be beat. Easy entertainment at the BareFoot Resort Complex for shopping, dining, childrens' amusements, live theater venues, etc. etc. The whole family should be entertained. Thank you again for giving us such a stellar review. We hope to see you again. Great location, good facilities, a home away from home. We certainly agree with your nice review. The owner of The Summit 3-C property takes great pride in making her place as comfortable for guest as when she visits herself. The furnishings and decor are meant to give you that "ahhhhhh" vacation feeling and let you totally relax; and the ocean views are complimentary with your stay. Glad to hear you enjoyed the beautiful Windy Hill beaches and hopefully you got to explore all that our great little beach town has to offer. Thank you for choosing to stay with us and when the time comes to make your next getaway plans, we are just a phone call away. Hope to see you again. 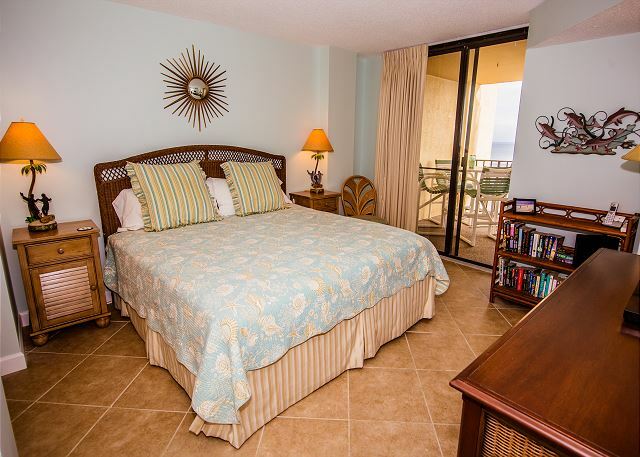 We were very pleased with the beach decor, beds and furnishings, we love the large oceanfront deck that wraps around from the living room to the master bedroom and we love that every bedroom has a full bathroom. 3C is well-equipped, including beach chairs, boogie boards and beach toys. We had everything we needed for a wonderful vacation. WOW thank you. We appreciate you taking the time to complete our survey and for staying with us. The Summit #3C is a great property as you said, a large unit that has absolutely everything, right down to the beach stuff; this owner has thought of everything. #3C has all of this and an amazing view as well. You can't go wrong with this The Summit #3C. Thank you again for staying with us and we hope to see you again next time.